DLC Game Packs are individual content packs for Elder Scrolls Online. Following the release of Tamriel Unlimited, all future content updates will be released as DLC, while base game features, bug fixes, and other "quality of life" updates will accompany the DLC release as a free base game patch. The term 'DLC' is a misnomer, as all players download the DLC game packs and can even trade for certain DLC-specific items. DLC can be bought permanently from the in-game Crown Store; alternatively, ESO Plus members are given access to all DLC for the duration of their subscription. No progress is lost should you cancel ESO Plus without first purchasing the DLC, and all items and skills earned will remain accessible. Loyalty Rewards can be obtained by accessing DLC either through the Crown Store or through ESO Plus. Accessible DLC appears in the Collections tab, separate from regular Collectibles. The introductory quest for each DLC can be received through this menu, although doing so is optional, as the quests can also be received naturally through regular gameplay. Summerset is considered a "Chapter" rather than a DLC. Chapters are not available via ESO Plus or the Crown Store and are therefore not listed here. Morrowind was previously only available as a Chapter, but has since been made available on the Crown Store with the release of Summerset. Get the first four Tamriel Unlimited DLC packs for one bargain price! Treat yourself to a broad array of new content for every play style. Guilds and Glory: The 4-DLC Mega-Pack is the first DLC bundle for ESO. Coinciding with the retail launch of the Gold Edition, the bundle contains the same four DLC game packs: Imperial City, Orsinium, Thieves Guild, and Dark Brotherhood. It was released on September 9, 2016, and can be purchased from the Crown Store for 055005,500 . Imperial City: Daedric forces have taken the Imperial City, and all three alliances vie to take it back. Experience hours of all-new PvP and PvE gameplay, both above ground and below, plus two new dungeons, never-before-seen monsters, craftable item sets, and more! Imperial City is a PvP-oriented DLC that introduces a new region to Cyrodiil: the Imperial City, currently under Daedric occupation. Imperial City has no associated loyalty reward. It's included with the Gold Edition of ESO and the Guilds and Glory bundle. 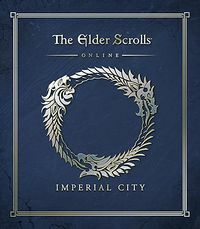 An Imperial City Collector's Bundle was made available for 055005,500 during the Planemeld Palpitation event to celebrate the DLC's one year anniversary, and was available again for 033003,300 during the DLC's second anniversary event. New quests, including a main storyline and daily repeatables. Tel Var Stones, a new player-lootable currency. The Imperial Sewers, a sprawling PvP-enabled Public Dungeon filled with boss fights and treasure. Six PvP-enabled Imperial Districts that function as Quest Hubs and capturable battlegrounds. Two new PvE Group Dungeons, the White-Gold Tower and the Imperial City Prison. Itemization, including new crafted sets, Tel Var-purchased sets, access to material for top-tier Veteran equipment, access to the Xivkyn style, and a new enchantment. Patrolling Horrors, powerful bosses found in the districts. Three 'events', round-based battles that take place in the Temple District, the Arena, and the Barathrum Centrata. Gated access, a new large-scale PvP goal in Cyrodiil (only enabled on some campaigns). Orsinium: Come to the homeland of the Orcs in Tamriel Unlimited's first new PvE quest content DLC! Help King Kurog rebuild the city of Orsinium, and watch its walls and towers rise due to your deeds. Includes new armor, weapons, a solo challenge arena, and more! Orsinium introduces the zone of Wrothgar, and focuses on singleplayer PvE content. The loyalty reward for Orsinium is an Echalette pet. The DLC was also available for purchase as part of the Orsinium DLC Collector's Edition bundle for 050005,000 . It's included with the Gold Edition of ESO and the Guilds and Glory bundle. Wrothgar, a large zone to explore, battle-levelled so as to be accessible at any level. A heavy emphasis on questing, including a main questline to rebuild Orsinium. Two new Public Dungeons, Old Orsinium and Rkindaleft. Maelstrom Arena, a solo challenge similar to Dragonstar Arena. Six new, challenging World Bosses. Itemization, including new sets, new Provisioning recipes, and access to the Ancient Orc style. Daily quests to clear delves and world bosses. Thieves Guild: Join the Thieves Guild in Hew's Bane, a never-before-seen area of Hammerfell! Explore Abah's Landing, a decadent port town ruled by corrupt merchant lords, who struggle with the Thieves Guild for power. New stories, delves, group bosses, and much more! Thieves Guild introduces the eponymous Thieves Guild faction, along with the zone of Hew's Bane. It focuses on stealth and the Justice System. The loyalty reward for Thieves Guild is a Jackal pet. The DLC was also available for purchase as part of the Thieves Guild Collector's Edition bundle for 040004,000 . It's included with the Gold Edition of ESO and the Guilds and Glory bundle. The Thieves Guild, a new faction with their own skill line. Hew's Bane, a small zone to explore, battle-levelled so as to be accessible at any level. New quests which take you to zones all across Tamriel, including a new storyline and repeatable Larceny jobs. Two new delves and two new group bosses. The Maw of Lorkhaj, a scaled 12-player trial located in Reaper's March. Itemization, including new craftable sets, powerful new trial sets, costumes, and access to the Outlaw style. An Assistant named Pirharri the Smuggler who functions as a summonable fence. Dark Brotherhood: Your talent for homicide has been noticed and an invitation has arrived—to join the Dark Brotherhood! Come to the Gold Coast, westernmost region of the old Empire, where opportunities abound for intrigue, conspiracy … and murder! It's one killer DLC. Dark Brotherhood introduces the Dark Brotherhood assassin faction, along with the Gold Coast zone. The loyalty reward is the Assassin Personality. The DLC is also available for purchase as part of the Dark Brotherhood Collector's Edition bundle for 040004,000 . It's included with the Gold Edition of ESO and the Guilds and Glory bundle. The Dark Brotherhood, a new faction with their own skill line (including a powerful insta-kill). Gold Coast, a new zone to explore, battle-levelled so as to be accessible at any level. New quests, including a new guild questline, several opportunities to aid old friends, and repeatable Contract and Black Sacrament jobs. Two new delves and group bosses. Itemization, including new costumes, motifs, and item sets. Dungeon: Ruins of Mazzatun: Venture into Mazzatun, the "Puzzle City" of the Xit-Xaht tribe of Argonians, who have been forcing other Lizardfolk to work as slave labor on a project that has driven their masters … mad! Can you free them in time? Shadows of the Hist is a dungeon pack DLC which introduces two Argonian-themed group dungeons. The loyalty reward is the Heroic Personality. Each dungeon is treated as a separate collectible for the purpose of obtaining the quests. The DLC is also available for purchase as part of the Shadows of the Hist Collector's Bundle for 025002,500 . Cradle of Shadows Normal and Veteran mode, with a new story quest and monster helm set. Ruins of Mazzatun Normal and Veteran mode, with a new story quest and monster helm set. Repeatable Undaunted pledges for both dungeons. New dungeon sets, two crafting motifs, and two new skins for completing Veteran mode challenges. Dungeon: Falkreath Hold: Long a symbol of Nord strength, the embattled city of Falkreath has endured countless conflicts with wild men from the Reach. Until now. Besieged by the mighty Dreadhorn minotaur and Reachman alliance, the final fate of Falkreath is all but sealed. Horns of the Reach is a dungeon pack DLC which introduces two Nord-themed group dungeons. 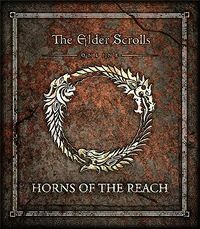 The DLC was also available for purchase as part of the Horns of the Reach Collector's Bundle for 035003,500 . The loyalty reward for Horns of the Reach is the Bull Horns Emote. Bloodroot Forge Normal and Veteran mode, with a new story quest and monster helm set. Falkreath Hold Normal and Veteran mode, with a new story quest and monster helm set. New dungeon sets with unique styles, and a new skin and hat for completing Veteran mode challenges. The ability to purchase two new player houses in Craglorn. Clockwork City: Enter the mechanical world of the Clockwork City and explore Sotha Sil's greatest creation. Clockwork City introduces Sotha Sil's eponymous realm of mechanical wonderment in all its glory, which is being invaded by shadowy Daedric forces. 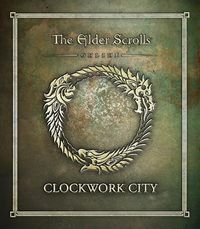 The DLC was also available for purchase as part of the Clockwork City Collector's Bundle for 040004,000 . The loyalty reward for Clockwork City is the Scintillant Dovah-Fly non-combat pet. The Clockwork City, a surreal mechanical zone to explore, populated by the proud Clockwork Apostles and the downtrodden Tarnished. New quests, including a questline that follows on from Morrowind in continuing the Daedric War storyline, with the chance to meet old acquaintances along the way. A new mini-trial, the Asylum Sanctorium, along with a new monster helm set. Access to the only world Transmutation Station, a way to change traits on weapons and armor. A free factotum target dummy furnishing item. Dragon Bones: Cultists conspire to unleash a plague, while necromancers attempt to reawaken a Bone Dragon. Put an end to these threats in the all-new Fang Lair and Scalecaller Peak Dungeons. Dragon Bones is a dungeon pack DLC which introduces two dragon-themed group dungeons. The DLC is also available for purchase as part of the Dragon Bones Collector's Bundle for 040004,000 . The loyalty reward for Dragon Bones is the Renegade Dragon Priest Mask hat. Fang Lair Normal and Veteran mode, with a new story quest and monster helm set. Scalecaller Peak Normal and Veteran mode, with a new story quest and monster helm set. New dungeon sets with unique styles, and a new collectible(?) for completing Veteran mode challenges. Morrowind: Morrowind is on the verge of destruction and only you can save it from a deadly Daedric threat. Discover the secrets of the island of Vvardenfell, and help the Dark Elves stop a meteor from crashing into Vivec City. The Morrowind DLC contains the Vvardenfell zone which was originally released in the Morrowind chapter. Not all of the content from the original chapter release is available in the DLC; Battlegrounds have moved to the base game and are accessible to everyone, while the Warden class is available separately as a Crown Store Upgrade. 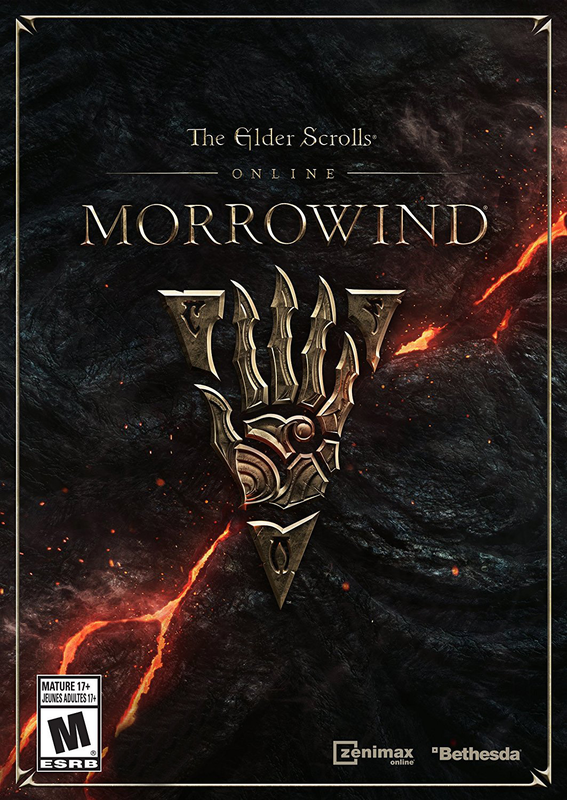 Certain promotional bonus content which was originally available in the Discovery Pack and Collector's Edition is available in the Crown Store as the Morrowind Collector's Pack. Vvardenfell, a large new zone. A new story, in which you must aid Vivec in regaining his lost powers as part of an emerging Daedric plot. A new 12-player trial, the Halls of Fabrication. Aid the Morag Tong in Balmora or help a slave ascend the ranks of the Telvanni in Sadrith Mora, among other side quests. Six new delves, six new group bosses, and two new public dungeons. Daily repeatable quests from the Ordinators of Vivec City and the Ashlanders of Ald'ruhn. Collectibles to earn, including pets, tattoos, and a personality. New dyes, styles, and sets, including three new crafting sites. A tomb hunting collection task that will take you all over Vvardenfell. Wolfhunter: Dive into all-new stories themed around Tamriel's werewolves and the Daedric Prince Hircine. Two dungeons, two very different environments filled with hordes of monsters, tricky boss encounters, and unique rewards for heroes who accept the challenge. 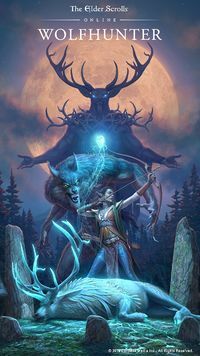 Wolfhunter is a dungeon pack DLC which includes two group dungeons related to werewolves and Hircine. The DLC is also available for purchase as part of the Wolfhunter Collector's Bundle for 040004,000 . The loyalty reward for Wolfhunter is the Werewolf Hunter Hat. March of Sacrifices Normal and Veteran mode, with a new story quest and monster helm set. Moon Hunter Keep Normal and Veteran mode, with a new story quest and monster helm set. New dungeon sets with unique styles, new titles, and new collectibles - new skin, new personality and a new dye - for completing Veteran mode challenges. 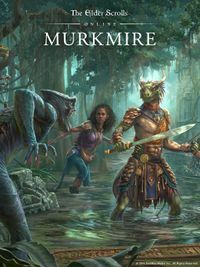 Murkmire: Travel to Murkmire, the southernmost region of mysterious Black Marsh, and venture into the deep swamps to learn some of the most hidden secrets of the Argonians! Murkmire features the new zone of Murkmire, and invites you to partake in an epic relic hunt. The DLC is also available for purchase as part of the Wolfhunter Collector's Bundle for 040004,000 . Murkmire was also available as a November 2018 daily login reward. The loyalty reward for Murkmire is the Verdigris Haj Mota non-combat pet. Murkmire, a new zone filled with treacherous swamps and jungles. New quests, including a questline featuring the society of Cyrodilic Collections. Help out the local tribes of Bright-Throat and Dead-Water. Blackrose Prison, a new challenging group arena. New armor sets, styles, furnishing items, and various collectibles. Three sets of new daily quests. Wrathstone: Uncover Tamriel's buried secrets and and begin the Season of the Dragon in Wrathstone. Explore mysterious ruins, face challenging bosses, and claim their riches and knowledge for yourself in two innovative new dungeons: Frostvault and Depths of Malatar. Wrathstone DLC kicks off the year-long event called the Season of the Dragon. Wrathstone is an upcoming dungeon pack DLC containing two new group dungeons, inviting you to explore Tamriel's hidden past alongside with Redguard scholar Tharayya and recover two halves of the mysterious Wrathstone. The DLC will also be available for purchase as part of the Wrathstone Collector's Bundle for 040004,000 . The loyalty reward for Wrathstone is the Ayleid Royal Crown headwear. Depths of Malatar Normal and Veteran mode, with a new story quest and monster helm set. Frostvault Normal and Veteran mode, with a new story quest and monster helm set. New dungeon sets with unique styles, two new titles, and new collectibles - Meridian Purified skin, new dye and a new non-combat pet - for completing Veteran mode challenges. Most DLCs launch with their own "Collector's Edition" bundle. These bundles last for one update cycle, and are retired following the release of the next major update or DLC pack. Some have been made available again temporarily during anniversary events. Get Cyrodilic with your personal Mind-Shriven Skin, a Mind-Shriven Horse to ride, a creepy Daedrat pet, and the mighty Imperial City DLC! The Imperial City Collector's Bundle was first available during the Planemeld Palpitation event, held on the first anniversary of the DLC's release from August 29 to September 7, 2016 (it was not available during the DLC's initial release quarter). The bundle included the Imperial City DLC, a Daedrat pet, the Mind-Shriven Horse mount, the Mind-Shriven Skin, and five Crown Experience Scrolls, and cost 055005,500 . It was made available again for the second anniversary of its release, as part of the Imperial City Anniversary event (September 7, 2017 to September 18, 2017), at a discounted price of 033003,300 . Take home the Orsinium DLC along with a Cave Bear Mount and her Cub, plus 5 Experience Scrolls! 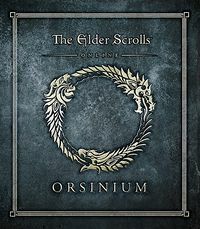 Originally released as the Orsinium DLC Collector's Edition for 050005,000 alongside Orsinium, this bundle was retired following the launch of Thieves Guild but was available again for a limited time during the Orsinium One-Year Anniversary event as the Orsinium Collector's Bundle for 020002,000 . The bundle included the Orsinium DLC, the Cave Bear mount, Cave Bear Cub pet, and five Crown Experience Scrolls. Get the Thieves Guild DLC plus bonuses: the Hammerfell Camel mount, the Kindlespit Dragon Frog pet, and 5 Experience Scrolls - all for a bargain price! 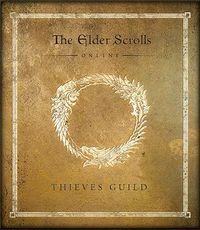 The Thieves Guild Collector's Edition was released alongside Thieves Guild for 040004,000 , and retired following the launch of Dark Brotherhood. It was available again for a limited time as the Thieves Guild Collector's Bundle during the Thieves Guild Anniversary event for 020002,000 . The bundle included the Thieves Guild DLC, the Hammerfell Camel mount, Kindlespit Dragon Frog pet, and five Crown Experience Scrolls. Now, for a discount price, get the Dark Brotherhood DLC plus the Highland Wolf mount, the Sylvan Nixad pet, and five Experience Scrolls! The Dark Brotherhood Collector's Edition was released alongside Dark Brotherhood and retired following the launch of Shadows of the Hist. The bundle included the Dark Brotherhood DLC, the Highland Wolf mount, Sylvan Nixad pet, and five Crown Experience Scrolls, and cost 040004,000 . Includes two dungeons, Cradle of Shadows and Ruins of Mazzatun, plus the Hist Guar mount, Haj Mota Hatchling pet, and 5 XP scrolls. 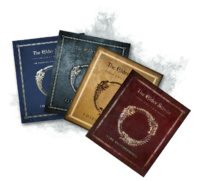 The Shadows of the Hist Collector's Bundle was released alongside Shadows of the Hist and retired following the launch of One Tamriel. The bundle included the Shadows of the Hist DLC, the Hist Guar mount, Haj Mota Hatchling pet, and five Crown Experience Scrolls, and cost 025002,500 . Take home the Horns of the Reach dungeon DLC and get bonus access to the Karthwolf Charger mount, Karthwolf Shepherd pet, and five Crown Experience Scrolls. The Horns of the Reach Collector's Bundle was released alongside Horns of the Reach and retired with the launch of The Clockwork City. The bundle included the Horns of the Reach DLC, the Karthwolf Charger mount, Karthwolf Shepherd pet, and five Crown Experience Scrolls, and cost 035003,500 . Includes the Clockwork City DLC, as well as a new Skeevaton pet, the Kagouti Fabricant mount, and Crown Experience Scrolls. The Clockwork City Collector's Bundle was released alongside The Clockwork City and retired with the launch of Dragon Bones. The bundle included The Clockwork City DLC, the Kagouti Fabricant mount, Skeevaton pet, and five Crown Experience Scrolls, and cost 040004,000 . In addition to the Fang Lair and Scalecaller Peak Dungeons, this bundle includes the exclusive Fang Lair Horse, the Small Bone Dragon Construct pet, and a stack of Experience Scrolls. The Dragon Bones Collector's Bundle was released alongside Dragon Bones and was retired when Morrowind became available in the Crown Store. The bundle included the Dragon Bones DLC, the Fang Lair Courser mount, Small Bone Dragon Construct pet, and five Crown Experience Scrolls, and cost 040004,000 . 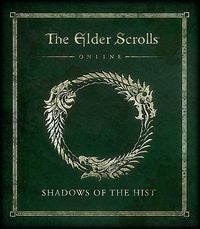 Includes all the bonus content of the Morrowind Digital Collector's Edition, as well as the Morrowind pre-order digital items. The Morrowind Collector's Pack was released alongside Summerset and is still available to purchase in the Crown Store. The bundle does not include Morrowind or the Warden class, but only the collectibles: Slate-Gray Summoned Bear skill mod, Dwarven War Mount, Dwarven War Dog and Dwarven Spider pets, Austere Warden Outfit, Morag Tong Conversion upgrade, a selection of Emotes, Vvardenfell CE Treasure Maps, 2 Experience Scrolls, and a single Dwarven Crown Crate, and costs 035003,500 . Take down those afflicted with the lycanthropic curse and come face-to-face with the Daedric Prince Hircine in Moon Hunter Keep and March of Sacrifices. Includes the exclusive Silver Dawn Argent Charger Mount, the noble Silver Daenian Werewolf Tracker, and more. The Wolfhunter Collector's Bundle was released alongside Wolfhunter and was retired with the release of Murkmire. The bundle included the Wolfhunter DLC, the Silver Dawn Argent Charger mount, Silver Daenian Werewolf Tracker pet, and five Crown Experience Scrolls, and cost 040004,000 . The Murkmire Collector's Bundle was released alongside Murkmire and retired with the release of Wrathstone. This bundle included the Murkmire DLC, the Shellback Warhorse mount, the Cantaloupe Swamp Jelly pet, and five Crown Experience Scrolls, and cost 040004,000 . The Season of the Dragon has begun! Face ancient Dwarven automatons in Frostvault and discover the fate of a lost Imperial legion in Depths of Malatar. Includes the exclusive Treasure Hunter's Horse Mount, Carnelian Theodolite Pet, and more. The Wrathstone Collector's Bundle was released alongside Wrathstone. The collector's bundle includes the Wrathstone DLC, the Treasure Hunter's Horse mount, the Carnelian Theodolite pet, and five Crown Experience Scrolls, and cost 040004,000 . Unannounced Q4 DLC A DLC containing a small zone. 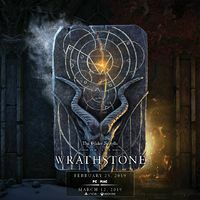 On the 15th of January 2019 it was announced the dungeon DLC Wrathstone would be released in Q1 of 2019 and it will kick start the Season of the Dragon. It was also announced that along with Wrathstone and the Elsweyr chapter that in Q3 2019 we will see another dungeon DLC and in Q4 a zone DLC similar in size to Murkmire, the details of these DLC have not been released but we know they will be themed around the final stages of the Season of the Dragon. 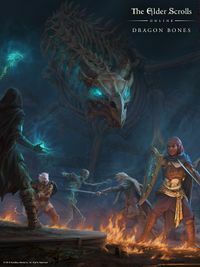 It has been mentioned previously that the ESO team at Zenimax have planned their DLC content past 2020 already. This page was last modified on 26 February 2019, at 09:40.